Nature is a constant source of inspiration for my quilts, whether traditional or artsy. Once I get an idea, it stays with me for a while until I finally get a chance to work on it. For art quilts, I start the design process by choosing the fabrics I would like to work with, instead of sketching the layout! I am not quite sure why, but paper and pencil do not work for me when composing art quilts, probably because I do not know how to draw... So, I go straight from brain to fabric. Occasionally, if I am having difficulty putting to fabric a particular aspect of the design, I will look elsewhere for drawings of that element, and compose from there (see my quilt 'Refuge' under the post http://www.piecedbrain.com/2012/05/home-machine-quilting-show.html). 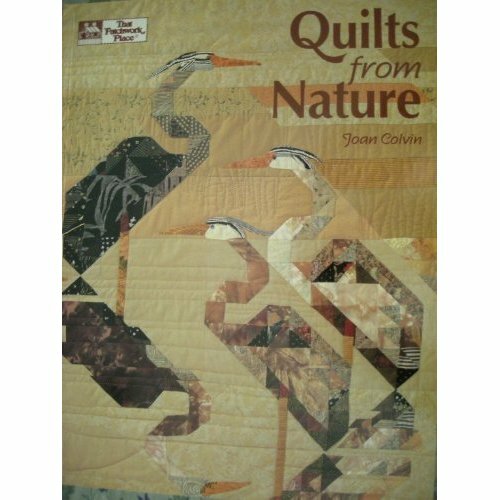 In her book Quilts from Nature, Joan Colvin gives a detailed and very instructive account of the design process for one of her beautiful quilts. It is as if her thoughts were recorded as they happen, and immediately printed for our evaluation. I loved it! Published in 1993, this book is just as relevant now as it was then: Joan explains well the elements of design (unity, visual movement, contrast, spatial relationships, negative space, etc), with objective, one or two paragraphs per topic. You will not be bored, just more inclined to compose eye-pleasing art. Her work is beautiful and very inspirational. I am so glad for artists who share their art-making process with us... Hooray for books!!! This is priya from http://priyas-pots-n-pans.blogspot.in. Thanks for visiting my blog. I am now a follower and hope you will also be able to follow my blog now. Keep up the good work. Thanks, Priya! I love your blog and have added you to my google circles, also! This looks like a neat book! I'll have to check it out!